Dr. Elliott Dacher has been a guest at Inside Personal Growth previously. I am honored to bring him back again to speak with us about his new book entitled ” Aware, Awake, Alive-A Contemporary Guide to the Ancient Science of Integral Health and Human Flourishing“. Prior to his deep work in the Indian modalities of health and healing, Dr. Dacher practiced Western medicine for over 21 years seeing over 50,000 patients. Over this period of time, Dr. Dacher was finding that for many of his patients that the conventional ways of Western medicine were not have a lasting and sustainable healing impact that he would have liked to have had. Through a series of serendipitous events Dr. Dacher ended up spending over 12 years going back and forth between the US and India studying the aspects of healing and what is termed in the book as “Human Flourishing”. As Dr. Dasher state in the book ” to flourish is to move beyond the stress, dissatisfaction, and suffering that too often limits and diminishes our lives, and reclaim the profound well-being which resides at the center of our being. That is our vision, a vision of human flourishing. Even though each of our lives has an inner and outer aspect, they are usually unequally developed. In modern times our focus has been on the outer aspects. We have mastered an understanding of biology. We know how to enhance our physical well-being, address physiological disturbances, reduce biological risk factors and promote high levels of physical wellness. As mythologist Joseph Campbell reminds us, “where there was once darkness there is now light”. We once knew very little about our biology, and now we know a great deal. But he also reminds us that, ” Were there was once light there is now darkness” There was a time we had a profound understanding of our inner life. We could describe and traverse, as Plato did, the full development of consciousness from darkness to light, from confusion to wisdom. But in modern times that is no longer the case. We have mastery of the outer world but we have simultaneously lost touch with our inner life. It has become a buried and unseen treasure. In Elliot’s book ” Aware, Awake, Alive” he provides the reader with a course of practice and study that is 10 weeks in length, along with more advanced material for those who master the basics and want to continue on. This book and workbook provides the student with a complete overview of the journey to human flourishing—vision, path, fruition, and integration. It also includes a CD to help the reader/student establish a stable and effective daily practice. 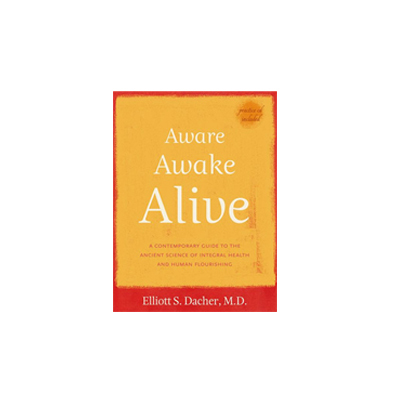 If you ready to transform your life completely, and have health, happiness and lasting bliss then you just might want to consider reading and studying the content of ” Aware, Awake, Alive” by Dr. Elliott Dacher. I know you will enjoy this enlightening interview with someone who has devoted their life to helping us understand the miracles of how doing the deep inner work will assist in healing our bodies. If you want to learn more about Dr. Dacher and his course please click here to be directed to his website.